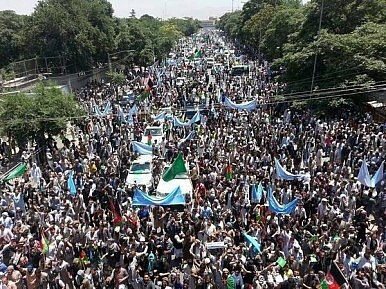 Abdullah Abdullah’s supporters have taken to the streets to protest allegations of fraud and ballot-stuffing. It was only a matter of time after the announcement of electoral fraud at the run-off elections in Afghanistan this year that Abdullah Abdullah’s supporters would take to the street. On Friday, thousands of supporters who had voted for Abdullah in the election or support his candidacy for president took to the streets of Kabul and marched towards the presidential palace. Their demand for now is that the government annul what are believed to be a significant number of fraudulent votes for Abdullah’s competitor, Ashraf Ghani. According to Afghanistan’s Pajhwok, the protesters chanted “Death to cheats, we have won and we don’t want sheep to participate” as they approached the presidential palace (the “sheep” the protesters refer to are the alleged vote stuffers). The protesters additionally have taken to slogans including “our votes must be respected,” “death to those who committed fraud in the election process,” and “our beloved president is Abdullah Abdullah,” according to one report by TOLO News. Afghanistan’s Independent Election Commission (IEC) has not yet responded to the protester’s demand that the votes be counted with greater scrutiny. One protester notes that the basic demand among Abdullah’s supporters is that the election commission “separate the fraudulent votes from the clean votes that the people had cast” in a transparent manner. As I wrote earlier in a reflection on Afghanistan’s election, these elections are a major tipping point for the country as it prepares for its most important political transition in recent history. The relatively clean April 5 elections boded well for the future of Afghanistan, but the allegations of widespread fraud benefiting Ashraf Ghani — widely seen as the “Pashtun candidate” in the presidential election — stand to damage the legitimacy of both Afghanistan’s government and its independent agencies such as the IEC. The protests seem to have the support of a broad base of Afghan politicians and leaders, including a former presidential candidate. According to Pajhwok, Abdullah joined the protesters along with Qayyum Karzai, Amrullah Saleh, Salahuddin Rabbani, and Allah Gul Mujahid among others. For now, the protests are still limited but they could spiral into a broader anti-government movement that could shake the fragile foundations of Afghanistan’s central government. In particular, this is a government that will need a modicum of legitimacy if it is to endure beyond the U.S. troop withdrawal. Allegations of fraud and corruption have marred the image of Afghanistan’s fragile democracy at a time when it needs its population to rally behind its institutions more than ever. The long-overdue parliamentary elections are set for October, according to the Independent Electoral Commission.